Being a trailing spouse can be a hard gig. 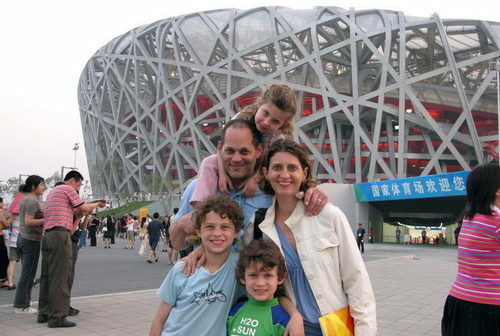 Former beijingkids columnist Alan Paul knows this well; his wife landed a great job with the Wall Street Journal’s bureau in Beijing and they picked up and went – taking their three kids along with them. At home in New York, Paul was a journalist a family man, a blues enthusiast and a hobby musician. In China, he landed as just a father. But that quickly changed. Paul went from being the “male trailing-spouse” to being “big in China.” Paul chronicled his three-year transformation Big in China: My Unlikely Adventures Raising a Family, Playing the Blues and Becoming a Star in China. The title is tongue-in-cheek, Paul admits, but the accomplishments can speak for themselves: Paul launched a blog, Expat Life on WSJ.com, and started a blues band, Woodie Alan. He turned his expat travelogue into a book, and his blues band’s debut CD, Beijing Blues, has been praised by members of ZZ Top and the Allman Brother’s Band. What does it mean to be “Big in China”? It means that I somehow used the opportunity provided by moving to China without too many responsibilities to fulfill several of my dreams, most importantly writing a column (The Expat Life for WSJ.com) and forming a band (Woodie Alan). They both succeeded beyond my wildest dreams. That was huge in every regard, but I never took it for granted or took myself too seriously. How did it feel to be a male trailing-spouse? Rephrase the question a bit and the answer will be obvious. Let’s try this: “How does it feel to move to one of the most fascinating places in the world and have your wife tell you she is doing well enough that you don’t have to work and only need to make sure the kids are okay at 4pm?” And, oh yeah, you can do whatever you want and people will praise you for your sacrifice. I feel sorry for any man too insecure to turn down that deal. What does your family think of you now that you’re “Big in China”? They roll their eyes. Personal successes only impact the family life in terms of making me happier and more fulfilled and hopefully able to be a better father and husband. What kind of person would want their own spouse or kids to treat them differently based on their level of success? You’ve done a great job expressing how you’ve changed since coming to China, but how do you think the experience of moving here has benefited your kids? My kids were 5, 8 and 11 when we moved back to the US and I am watching them to see what the impact will be. One thing that has definitely happened is they simply have a keen understanding of how big the world is and that people everywhere are going about their lives. They know they can pick themselves up, go anywhere and continue being themselves and having a great life. My oldest son is now 13 and he really loves China. He not only misses his friends, but I truly believe that China itself is a part of him and I plan on trying to make sure it remains so. As he gets a little older, I hope to spend some summers there with him, working together to teach English in rural Yunnan. It gave her career a great boost. She is now the Foreign Editor and a Deputy Managing Editor at the Wall Street Journal. She was working too hard to have the same kind of personal reinvention I did. She really enjoyed virtually everything about the experience except the 24/7 work schedule which a lot of Asian-based expats working for US companies understand. I think it gave her more confidence in her ability to navigate any obstacles. And, like me, she had a consistently good time. It was a perfect place for her to work hard and play hard. Everybody knows that there are challenges to living abroad. What about the challenges to living in ‘Expat-Land’, as you put it? Expat Land can be simultaneously isolating and comforting. One of the primary challenges is to push out of it and remember that your timeline in your temporary home is brief and the clock is always ticking. Get out there and live it up! What challenges did you face as a parent in Beijing? How did you deal with them? One thing I thought was unique to living in Expat Land was we worried about our kids getting spoiled and having a sense of entitlement. We lived a much more glamorous life there than we did or do in New Jersey, with a lot of fabulous travel and so much daily help. We dealt with them by matching every luxurious beach vacation with a trip to China’s interior and by continuing to make our kids do chores around the house and understand how fortunate we all were. Another challenge was the constant turnover in Expat Land. Every few months someone had to say good bye to a dear friend and that was challenging for the kids. We tried to always remind them how great it was to have friends all over the world, and to just keep talking to them and be in tune with their concerns. Any advice for newcomers to Expat Land? Seek out like-minded friends. Avoid people who are too negative; they will drag you down. Enjoy the benefits of Expat Land, but remember it is a bubble and make efforts to get out and get into Beijing – or wherever else you are living. Any advice for trailing spouses? How has moving to China been good for your family? In too many ways to answer briefly, but to sum up: it gave us confidence that we can live anywhere and thrive in a radically different place; it helped us be more international in our outlook. Having a better understanding of China can only be a good thing.